No need to worry, everyone has been there! Inner Revolution offers a safe space for you to practice. With certified instructors and a warm caring environment for you to absorb all the benefits yoga has to offer. JOIN US FOR A BEGINNER YOGA CLASS! Held once a week on Saturday from 10:45-11:45 am. Our yoga for beginner classes are designed around teaching and breaking down yoga poses most commonly practiced. This is a safe place where questions can be asked and concerns addressed about any of the poses or the yoga practice itself. 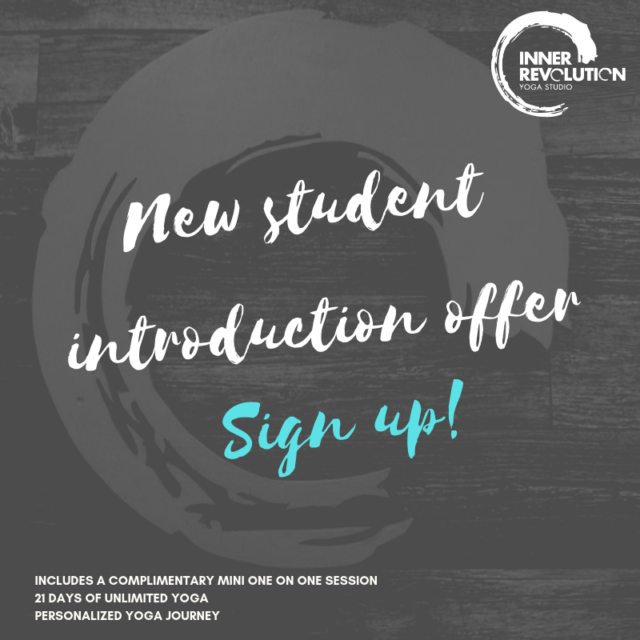 You are welcome to attend as many yoga for beginner classes as you wish until you have the confidence to do any of the classes offered at Inner Revolution. To register for this class please call the studio or sign up online. Please arrive 10 min early to sign in and get a spot. The studio door will be locked at the time class starts. Please stay for the full class. Leaving during meditation or before disrupts the practice of others. If you must leave, please let your instructor know and leave before meditation starts. Scent Free. Please avoid strong scents during your practice. Open the mind, lengthen the body and let go of stress.